There’s an old saying: Notice how you’ve never seen a motorcycle parked outside a psychiatrist’s office? That tells you a lot about how motorcycling makes you feel. And that holds especially true if you’re talking about a machine like Honda’s do-it-all CRF250L. This is bikes that fully embrace all that motorcycling has to offer, on- and off-road. This is light, simple, and a blast to ride. And also extraordinarily practical: rugged, narrow, minimalistic, built to survive everything from barren desert to your weekday commute. CRF250L use the same proven engine: a liquid-cooled fuel-injected single cylinder with electric starting. CRF250L offer some pretty awesome fuel economy. Long-travel suspension front and rear is designed to soak up the bumps and rocks trail riding can toss your way, so you know it’s going to handle the lousy pavement you’ll encounter. 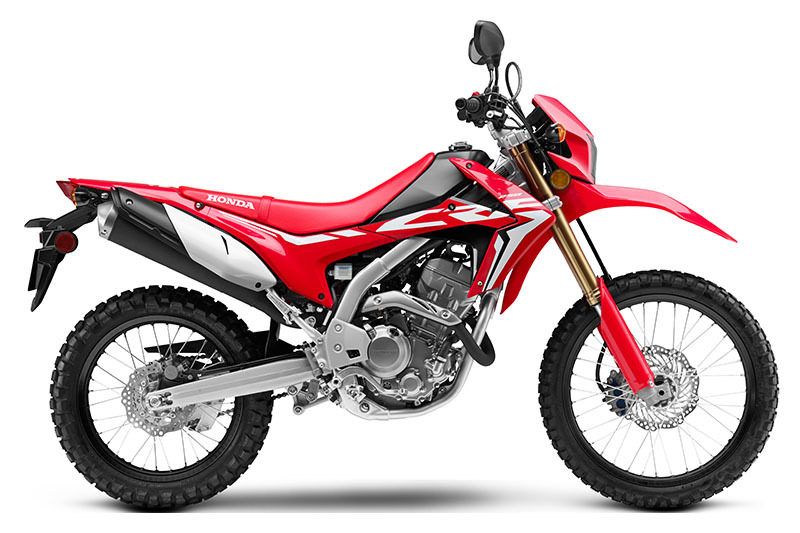 The CRF250L even available with optional ABS. Want to know which one is right for you? The CRF250L costs a little less, and is a little lighter. It's an excellent choice as a first bike, a second bike, or even your only way to get around. Bottom line: The CRF250L is one of the best forms of personal transportation you could ever hope for! PRO-LINK® REAR SUSPENSION: Thanks to our single-shock Pro-Link rear suspension, the CRF250L models deliver excellent comfort, traction and handling, while also improving rider confidence. SINGLE-CYLINDER ENGINE: A single is the perfect choice for a bike like the CRF250L. It's light, simple, returns excellent fuel economy, and features a broad powerband with plenty of low-revving torque—just what you want in this type of a motorcycle. DIGITAL INSTRUMENTATION: The CRF250L's digital instrument cluster is integrated with the headlight visor, and gives you all the information you need: Speedometer, clock, twin tripmeter, fuel gauge, and more.